Hutcheson’s topdressing B sand is an important tool in my management program on the greens at Burlington Golf & Country Club. I have come to rely on its consistency as it is a washed USGA spec’d material and it being delivered on time. Hutcheson Sand sets the standard in the turf industry for producing the best topdressing sand. As a leading supplier of golf course mixes from established sand sources, Hutcheson Sand and Mixes has the expertise you need when you are planning a new golf course and need to source a suitable sand for the rootzone mix for your greens and tees. Hutcheson Sand & Mixes works with soils labs, golf course architects and contractors to assess available sand sources and help develop mix designs. 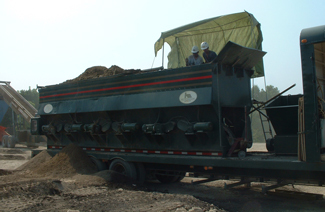 Hutcheson’s Mobile Blending Service operates special bulk blending equipment and supervises and controls the entire blending operation. Hutcheson Sand & Mixes provides continuous on-site quality control testing of mixed product to maintain mix within +/-1% of the specified range. This ensures an accurately mixed and consistent rootzone material, something that cannot be achieved using alternative belt-blending technologies or conventional bucket mixing.